This is Glasgow’s newest and shiniest bridge over the river Clyde, opened just over a month ago. I’m not sure what it’s called (I’ve seen someone on flickr refer to it as “Squiggly”, in keeping with the second-newest bridge the Squinty a little way up the river which has featured here plenty of times before). I’ll show a closer view tomorrow. The yellow things in the foreground are from the ladders at the lifebelt stations which are dotted along the river in case someone gets into difficulty. This entry was posted on June 24, 2009 at 12:01 am	and is filed under Uncategorized. 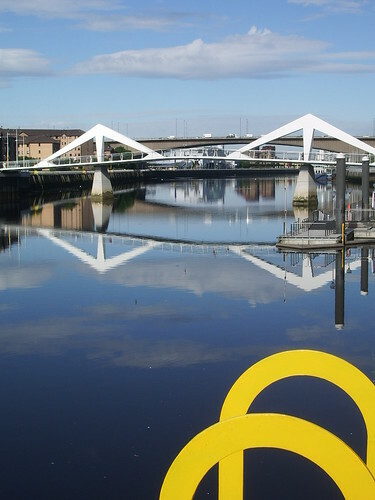 Tagged: bridge, Clyde, Glasgow, reflection, river. You can follow any responses to this entry through the RSS 2.0 feed. Both comments and pings are currently closed. Very modern looking! I like it. Very modern and minimalist. I don’t think ‘squiggly’ quite fits it though. ‘Pointy,’ yes. Jackie, there’s a thread in the forum suggesting that the two not be named. Life, which published some of the missing photographer’s photos, didn’t name him either. He may have been picked up without knowledge of his actions, just as part of the general protesters’ arrests. Either way, it’s horrible what’s happening in Tehran. Sorry Hilda I only just saw your comment, have removed all names as requested. I’ll go take a look at the forum now. I’ve also blogged about Tehran 24. Please, if I have included personal information, tell me.